Well, I didn't make it. No shame, but I am disappointed. Sunday night at 9:30, having left Baker and on the road to Kelso, I stopped riding and got in the van. After having born pain in my feet for two days, it suddenly became unbearable. 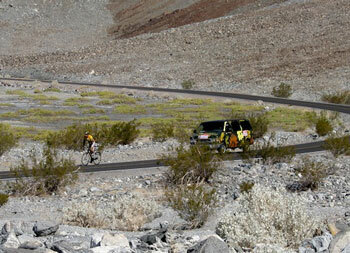 I wasn't so much as decision as an acknowledgement; I was again unable to finish the Furnace Creek 508. 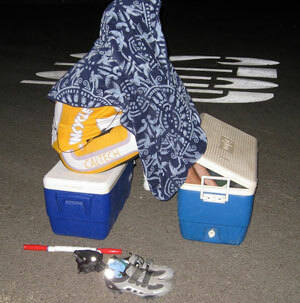 This picture was taken Saturday midnight in Stovepipe Wells, icing my feet as I had about ten times during the day. Wondering if I was going to make it. 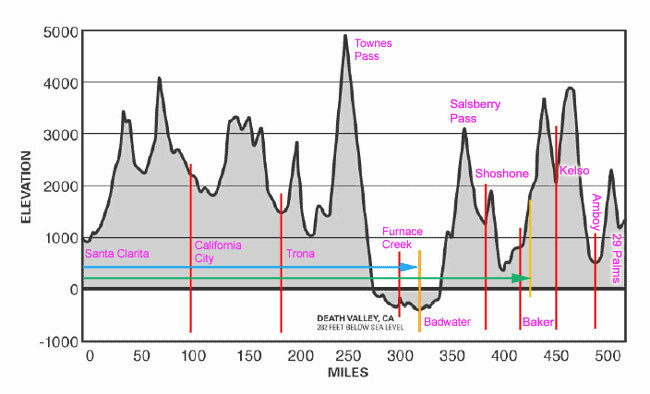 If you're a friend or frequent reader you know, I rode this race in 2009 and made it 300 miles. This year I made it 400 miles. That feels like progress, but in one sense this the race is binary; you either go 508 miles and finish or you don't. And I didn't finish then and I didn't finish now. The reasons were very different but the high-level result is the same. And yet it doesn't feel the same at all. Here's a profile of the race course; the red lines are the time stations which delimit the race stages, the blue arrow shows how far I made it in 2009, and the green arrow shows how far I made it this year. In 2009 I got off to a flying start and cruised into Death Valley four hours ahead of schedule. Then the winds started to howl and my head blew up and I just couldn't take it. After resting for a bit in Furnace Creek I struggled in the dark for a while before abandoning in Badwater. Almost immediately I wished I'd kept trying, and in the two years since I've promised myself there would be a next time, and when there was I wouldn't stop. This year I got off to a terrible start, lost my GPS unit and fifteen minutes searching for it three miles into the ride, and had my feet start hurting almost immediately. By California City I was in serious pain, and switched bikes, pedals, shoes, and everything else to deal with it. Icing my feet in a cooler seemed to be the only thing that worked, and that only for short periods of time. I made it Randsburg, iced, made it to Trona, iced, made it through Panamint Valley, iced, and then vowed to summit Townes Pass. I climbed it - in fine style, if I may say - and then descended down into Death Valley. Yay; after more ice and a longish rest, onward into day two! But day two brought more pain, lots more ice, and lots of lost time while icing. By the time I reached Shoshone I was running out of time and wearing down. I vowed to reach Baker, and did. From there I had 10 hours left to ride, with 120 miles and 7,000' of climbing. Just barely doable. I took off for Kelso, and suddenly I couldn't do it anymore. The exhaustion and strain brought down my threshold of pain to the point where I couldn't continue. Boo. I will make a longer post with many of the great pictures which were taken but I must not end this one without thanking my amazing crew, Mitch Albo, Mark Elliot, and Gene Smith. I also have to tell you about my new bike which was incredible, and about the van, which worked out perfectly, and so many other things ... please stay tuned!